A man trying to escape from the past, needs a woman who can see the future. 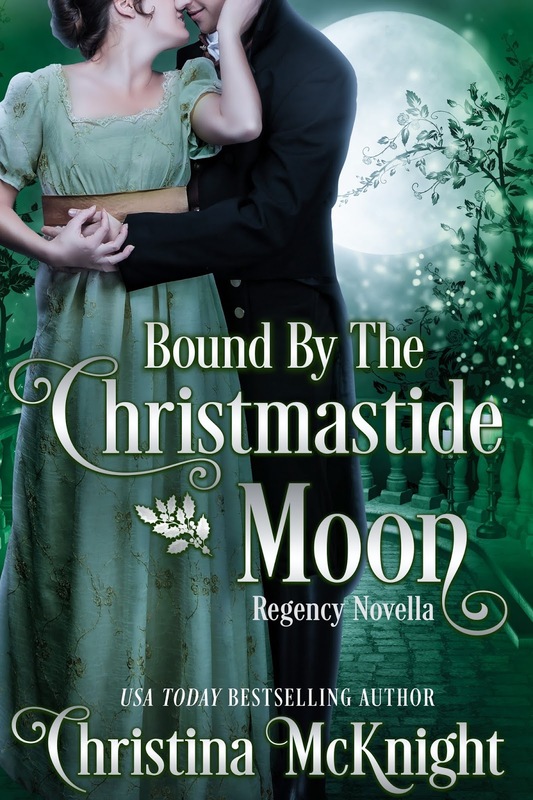 Available September 11th – Holiday Paranormal Regency Romance, Bound by the Christmastide Moon by Christina McKnight. When Silas Anson inherits the earldom of Lichfield from a father he never knew, he has one goal: protect his siblings. To do so, he’ll need to do two things: replenish the estate’s depleted coffers, and gain the support of his powerful family—even though they betrayed his mother years ago. An arranged marriage with the daughter of the Marquess of Blandford will accomplish both of these objectives, while giving him a chance at a normal, happy life. NEEDS A WOMAN WHO CAN SEE THE FUTURE. Except Lady Mallory Hughes isn’t the normal debutante he expects. Along with a large dowry, she’s inherited her family’s gift for predicting the future. For years, her family has kept her hidden away from society, for fear she will bring the family shame. If she is ever to have a chance at an independent existence—and love—she must get through this week without alerting Silas about her visions. But when Mallory touches Silas, she sees his death. With Silas’s life on the line, how can Mallory save him without revealing her gift, and risking their chance at a future together? Mallory paused, her aunt colliding with her shoulder at the sudden stop. She’d dressed that day as she did each morn. The gown she wore had been specifically packed because it highlighted her ample curves and hid her not-so-narrow waist. The ribbon woven through her long, brown curls was of a deep plum that complemented her grey gown. Her shoes were half-boots, sturdy enough for a walk about Tetbery Estate. Except for the ink marring her hand, Mallory appeared as she always did. Everything the daughter of a marquess was raised to be. That she was anything but poised on the inside was of no consequence, so long as she did her utmost to keep those around her blissfully unaware. Her talent as an oracle—or a clairvoyant—did not define Mallory. In fact, she was determined to prove her family wrong and live a normal life. That she’d need refrain from touching others—and most objects—did not deter her from believing a normal life could be hers. Mallory squared her shoulders and marched into the foyer, pausing only to allow the butler to open the parlor door and announce their arrival. “Lady Henrietta Hughes and Lady Mallory Hughes,” Tolsworth proclaimed, giving Mallory a reassuring nod as she swept past him and into the room. She was vaguely aware of her aunt entering the parlor behind her and the butler pulling the door closed after stating tea would arrive with all due haste; however, Mallory stood rooted to the spot. She hadn’t thought about what Lord Lichfield would look like, nor considered his age when she’d been told of the potential match. He could have been plagued with a hunched back or vertically challenged, but she hadn’t questioned that. The man who stood to greet them was not what she’d envisioned in an arranged marriage. He was not stout or rounded. He was in possession of all his extremities. And he certainly was not of an age past his prime. Lord Lichfield did, however, tower over both Mallory and Hettie. The earl’s shoulders were broad enough to pull a cart or roll a boulder up a hill. And he was handsome. Not in the tradition English sense with a sharp nose, angular jaw, and rigid stance. No, it was far more—yet far less—what her brethren in muslin considered a dashing man. He had a sophisticated air about him. As if he had seen things, experienced things, Mallory could only guess at. His clenched jaw, and his clear blue eyes cascading over her, made Mallory wish she’d donned a gown that didn’t constrict her breathing in such a manner, as she found it exceedingly difficult to gain a proper breath. Her stomach fluttered—actually fluttered as he gazed upon her. A single black curl fell over one eye, and he pushed it back before turning his attention to Aunt Hettie. “Heaven’s above,” Hettie hissed in her ear. Review: I am a huge Christina McKnight fan. 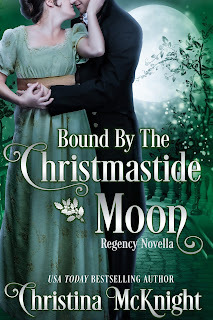 I love Regency romance and I love holiday books. Combine an arranged marriage and a little bit of a twist involving psychic abilities and you have a short wonderful read. I loved Silas and Mallory, and they were wonderful together. Both were as the old song goes "a couple of misfits." Silas because of his unusual family situation and Mallory because of her "ability." That ability has her seeing the death of her betrothed. and though they don't know each other well, she wants to be married so she can have a life of her own.. I love how things worked out for them and how her psychic ability got something wrong. This was a really quick read, and I love stories that I can read in a few hours, especially after I've read something heavier. This book was refreshing and the characters were sweet. As with most novellas there's always something I wanted a bit more of, and in this case it was Silas' family. I definitely wanted more about his mom and the hows and whys of her taking off with them to France. That's the one thing that made me wish this particular story would have been a full length novel, because there were so many areas that could have been explored. However that didn't detract from the story at all. That was just me being greedy.